by Chris Woodford. Last updated: May 12, 2018. Why do we waste time drilling for oil and shoveling coal when there's a gigantic power station in the sky up above us, sending out clean, non-stop energy for free? The Sun, a seething ball of nuclear power, has enough fuel onboard to drive our Solar System for another five billion years—and solar panels can turn this energy into an endless, convenient supply of electricity. Solar power might seem strange or futuristic, but it's already quite commonplace. You might have a solar-powered quartz watch on your wrist or a solar-powered pocket calculator. Many people have solar-powered lights in their garden. Spaceships and satellites usually have solar panels on them too. 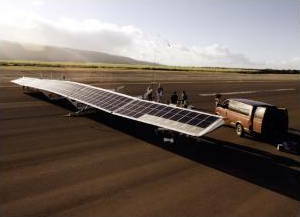 The American space agency NASA has even developed a solar-powered plane! As global warming continues to threaten our environment, there seems little doubt that solar power will become an even more important form of renewable energy in future. But how exactly does it work? Photo: NASA's solar-powered Pathfinder airplane. The upper wing surface is covered with lightweight solar panels that power the plane's propellers. Picture courtesy of NASA Armstrong Flight Research Center. How much energy can we get from the Sun? Photo: The amount of energy we can capture from sunlight is at a minimum at sunrise and sunset and a maximum at midday, when the Sun is directly overhead. Solar power is amazing. On average, every square meter of Earth's surface receives 164 watts of solar energy (a figure we'll explain in more detail in a moment). In other words, you could stand a really powerful (150 watt) table lamp on every square meter of Earth's surface and light up the whole planet with the Sun's energy! Or, to put it another way, if we covered just one percent of the Sahara desert with solar panels, we could generate enough electricity to power the whole world. That's the good thing about solar power: there's an awful lot of it—much more than we could ever use. But there's a downside too. 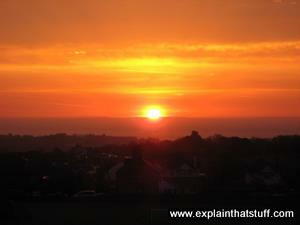 The energy the Sun sends out arrives on Earth as a mixture of light and heat. Both of these are incredibly important—the light makes plants grow, providing us with food, while the heat keeps us warm enough to survive—but we can't use either the Sun's light or heat directly to run a television or a car. We have to find some way of converting solar energy into other forms of energy we can use more easily, such as electricity. And that's exactly what solar cells do. 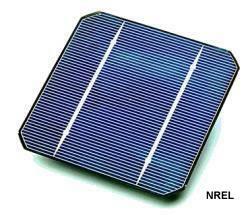 A solar cell is an electronic device that catches sunlight and turns it directly into electricity. It's about the size of an adult's palm, octagonal in shape, and colored bluish black. Solar cells are often bundled together to make larger units called solar modules, themselves coupled into even bigger units known as solar panels (the black- or blue-tinted slabs you see on people's homes—typically with several hundred individual solar cells per roof) or chopped into chips (to provide power for small gadgets like pocket calculators and digital watches). Photo: The roof of this house is covered with 16 solar panels, each made up of a grid of 10×6 = 60 small solar cells. On a good day, it probably generates about 4 kilowatts of electricity. Just like the cells in a battery, the cells in a solar panel are designed to generate electricity; but where a battery's cells make electricity from chemicals, a solar panel's cells generate power by capturing sunlight instead. They are sometimes called photovoltaic (PV) cells because they use sunlight ("photo" comes from the Greek word for light) to make electricity (the word "voltaic" is a reference to Italian electricity pioneer Alessandro Volta, 1745–1827). How are solar cells made? Photo: A single solar cell. Picture by Rick Mitchell, courtesy of US Department of Energy/National Renewable Energy Laboratory (DOE/NREL). Silicon is the stuff from which the transistors (tiny switches) in microchips are made—and solar cells work in a similar way. Silicon is a type of material called a semiconductor. Some materials, notably metals, allow electricity to flow through them very easily; they are called conductors. Other materials, such as plastics and wood, don't really let electricity flow through them at all; they are called insulators. Semiconductors like silicon are neither conductors nor insulators: they don't normally conduct electricity, but under certain circumstances we can make them do so. When we place a layer of n-type silicon on a layer of p-type silicon, a barrier is created at the junction of the two materials (the all-important border where the two kinds of silicon meet up). No electrons can cross the barrier so, even if we connect this silicon sandwich to a flashlight, no current will flow: the bulb will not light up. But if we shine light onto the sandwich, something remarkable happens. We can think of the light as a stream of energetic "light particles" called photons. As photons enter our sandwich, they give up their energy to the atoms in the silicon. The incoming energy knocks electrons out of the lower, p-type layer so they jump across the barrier to the n-type layer above and flow out around the circuit. The more light that shines, the more electrons jump up and the more current flows. This is what we mean by photovoltaic—light making voltage—and it's one kind of what scientists call the photoelectric effect. 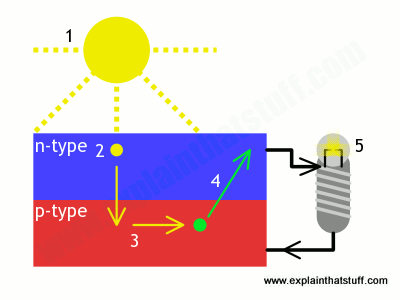 Artwork: How a simple, single-junction solar cell works. When sunlight shines on the cell, photons (light particles) bombard the upper surface. The photons (yellow blobs) carry their energy down through the cell. The photons give up their energy to electrons (green blobs) in the lower, p-type layer. The electrons use this energy to jump across the barrier into the upper, n-type layer and escape out into the circuit. Flowing around the circuit, the electrons make the lamp light up. That's a basic introduction to solar cells—and if that's all you wanted, you can stop here. The rest of this article goes into more detail about different types of solar cells, how people are putting solar power to practical use, and why solar energy is taking such a long time to catch on. 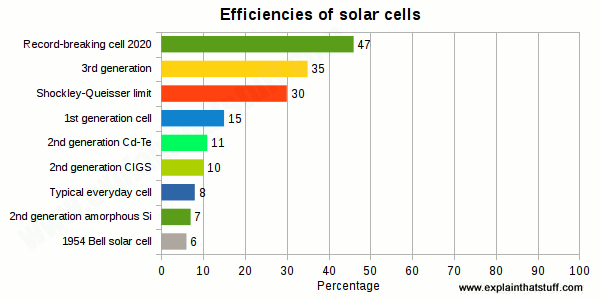 How efficient are solar cells? Chart: Efficiencies of solar cells compared: The very first solar cell scraped in at a mere 6 percent efficiency; the most efficient one that's been produced to date managed 46 percent in laboratory conditions. Most cells are first-generation types that can manage about 15 percent in theory and probably 8 percent in practice. A basic rule of physics called the law of conservation of energy says that we can't magically create energy or make it vanish into thin air; all we can do is convert it from one form to another. That means a solar cell can't produce any more electrical energy than it receives each second as light. In practice, as we'll see shortly, most cells convert about 10–20 percent of the energy they receive into electricity. A typical, single-junction silicon solar cell has a theoretical maximum efficiency of about 30 percent, known as the Shockley-Queisser limit. That's essentially because sunlight contains a broad mixture of photons of different wavelengths and energies and any single-junction solar cell will be optimized to catch photons only within a certain frequency band, wasting the rest. Some of the photons striking a solar cell don't have enough energy to knock out electrons, so they're effectively wasted, while some have too much energy, and the excess is also wasted. The very best, cutting-edge laboratory cells can manage 46 percent efficiency in absolutely perfect conditions using multiple junctions to catch photons of different energies. Real-world domestic solar panels might achieve an efficiency of about 15 percent, give a percentage point here or there, and that's unlikely to get much better. First-generation, single-junction solar cells aren't going to approach the 30 percent efficiency of the Shockley-Queisser limit, never mind the lab record of 46 percent. All kinds of pesky real-world factors will eat into the nominal efficiency, including the construction of the panels, how they are positioned and angled, whether they're ever in shadow, how clean you keep them, how hot they get (increasing temperatures tend to lower their efficiency), and whether they're ventilated (allowing air to circulate underneath) to keep them cool. Most of the solar cells you'll see on people's roofs today are essentially just silicon sandwiches, specially treated ("doped") to make them better electrical conductors. Scientists refer to these classic solar cells as first-generation, largely to differentiate them from two different, more modern technologies known as second- and third-generation. So what's the difference? Photo: A colorful collection of first-generation solar cells. Picture courtesy of NASA Glenn Research Center (NASA-GRC). About 90 percent of the world's solar cells are made from wafers of crystalline silicon (abbreviated c-Si), sliced from large ingots, which are grown in super-clean laboratories in a process that can take up to a month to complete. The ingots either take the form of single crystals (monocrystalline or mono-Si) or contain multiple crystals (polycrystalline, multi-Si or poly c-Si). First-generation solar cells work like we've shown in the box up above: they use a single, simple junction between n-type and p-type silicon layers, which are sliced from separate ingots. So an n-type ingot would be made by heating chunks of silicon with small amounts of phosphorus, antimony, or arsenic as the dopant, while a p-type ingot would use boron as the dopant. Slices of n-type and p-type silicon are then fused to make the junction. A few more bells and whistles are added (like an antireflective coating, which improves light absorption and gives photovoltaic cells their characteristic blue color, protective glass on front and a plastic backing, and metal connections so the cell can be wired into a circuit), but a simple p-n junction is the essence of most solar cells. It's pretty much how all photovoltaic silicon solar cells have worked since 1954, which was when scientists at Bell Labs pioneered the technology: shining sunlight on silicon extracted from sand, they generated electricity. 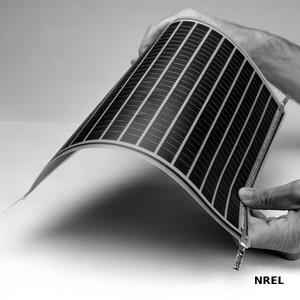 Photo: A thin-film, second-generation solar "panel." The power-generating film is made from amorphous silicon, fastened to a thin, flexible, and relatively inexpensive plastic backing (the "substrate"). Photo by Warren Gretz courtesy of NREL (image id #6321083). 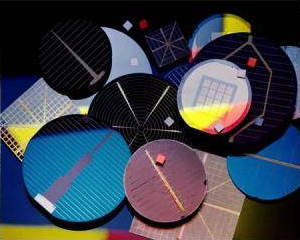 Classic solar cells are relatively thin wafers—usually a fraction of a millimeter deep (about 200 micrometers, 200μm, or so). But they're absolute slabs compared to second-generation cells, popularly known as thin-film solar cells (TPSC) or thin-film photovoltaics (TFPV), which are about 100 times thinner again (several micrometers or millionths of a meter deep). Although most are still made from silicon (a different form known as amorphous silicon, a-Si, in which atoms are arranged randomly instead of precisely ordered in a regular crystalline structure), some are made from other materials, notably cadmium-telluride (Cd-Te) and copper indium gallium diselenide (CIGS). Because they're extremely thin, light, and flexible, second-generation solar cells can be laminated onto windows, skylights, roof tiles, and all kinds of "substrates" (backing materials) including metals, glass, and polymers (plastics). What second-generation cells gain in flexibility, they sacrifice in efficiency: classic, first-generation solar cells still outperform them. So while a top-notch first-generation cell might achieve an efficiency of 15–20 percent, amorphous silicon struggles to get above 7 percent, the best thin-film Cd-Te cells only manage about 11 percent, and CIGS cells do no better than 7–12 percent. That's one reason why, despite their practical advantages, second-generation cells have so far made relatively little impact on the solar market. 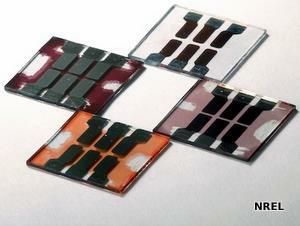 Photo: Third-generation plastic solar cells produced by researchers at the National Renewable Energy Laboratory. Photo by Jack Dempsey courtesy of NREL (image id #6322357). The latest technologies combine the best features of first and second generation cells. Like first-generation cells, they promise relatively high efficiencies (30 percent or more). Like second-generation cells, they're more likely to be made from materials other than "simple" silicon, such as amorphous silicon, organic polymers (making organic photovoltaics, OPVs), perovskite crystals, and feature multiple junctions (made from multiple layers of different semiconducting materials). Ideally, that would make them cheaper, more efficient, and more practical than either first- or second-generation cells. How much power can we make with solar cells? "The total solar energy that reaches the Earth's surface could meet existing global energy needs 10,000 times over." European Photovoltaic Industry Association/Greenpeace, 2011. In theory, a huge amount. Let's forget solar cells for the moment and just consider pure sunlight. Up to 1000 watts of raw solar power hits each square meter of Earth pointing directly at the Sun (that's the theoretical power of direct midday sunlight on a cloudless day—with the solar rays firing perpendicular to Earth's surface and giving maximum illumination or insolation, as it's technically known). In practice, after we've corrected for the tilt of the planet and the time of day, the best we're likely to get is maybe 100–250 watts per square meter in typical northern latitudes (even on a cloudless day). That translates into about 2–6 kWh per day (depending on whether you're in a northern region like Canada or Scotland or somewhere more obliging such as Arizona or Mexico). Multiplying up for a whole year's production gives us somewhere between 700 and 2500 kWh per square meter (700–2500 units of electricity). Hotter regions clearly have much greater solar potential: the Middle East, for example, receives around 50–100 percent more useful solar energy each year than Europe. Unfortunately, typical solar cells are only about 15 percent efficient, so we can only capture a fraction of this theoretical energy. That's why solar panels need to be so big: the amount of power you can make is obviously directly related to how much area you can afford to cover with cells. A single solar cell (roughly the size of a compact disc) can generate about 3–4.5 watts; a typical solar module made from an array of about 40 cells (5 rows of 8 cells) could make about 100–300 watts; several solar panels, each made from about 3–4 modules, could therefore generate an absolute maximum of several kilowatts (probably just enough to meet a home's peak power needs). 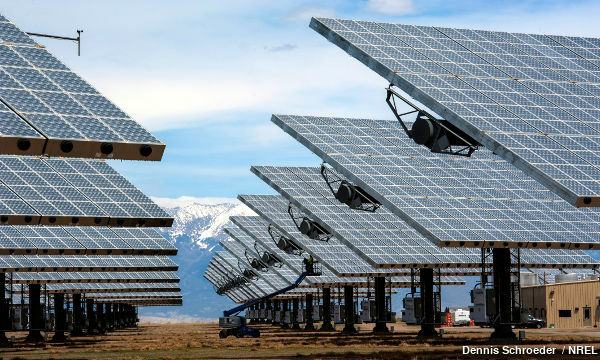 Photo: The vast 91-hectare (225-acre) Alamosa Solar Generating Project in Colorado generates up to 30 megawatts of solar power using three cunning tricks. First, there are huge numbers of photovoltaic panels (500 of them, each capable of making 60kW). Each panel is mounted on a separate, rotating assembly so it can track the Sun through the sky. 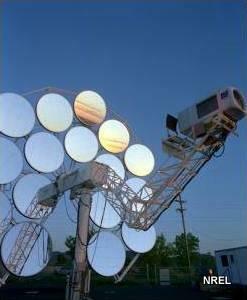 And each has multiple Fresnel lenses mounted on top to concentrate the Sun's rays onto its solar cells. Photo by Dennis Schroeder courtesy of NREL (image id #10895528). But suppose we want to make really large amounts of solar power. To generate as much electricity as a hefty wind turbine (with a peak power output of maybe two or three megawatts), you need about 500–1000 solar roofs. And to compete with a large coal or nuclear power plant (rated in the gigawatts, which means thousand megawatts or billions of watts), you'd need 1000 times as many again—the equivalent of about 2000 wind turbines or perhaps a million solar roofs. (Those comparsions assume our solar and wind are producing maximum output.) Even if solar cells are clean and efficient sources of power, one thing they can't really claim to be at the moment is efficient uses of land. Even those huge solar farms now springing up all over the place produce only modest amounts of power (typically about 20 megawatts, or about 1 percent as much as a large, 2 gigawatt coal or nuclear plant). The UK renewable company Ecotricity has estimated that it takes about 22,000 panels laid across a 12-hectare (30-acre) site to generate 4.2 megawatts of power, roughly as much as two large wind turbines and enough to power 1,200 homes. 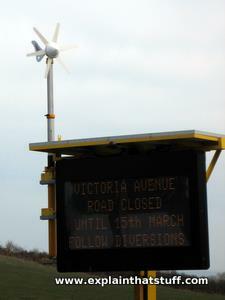 Photo: A micro-wind turbine and a solar panel work together to power a bank of batteries that keep this highway construction warning sign lit up day and night. The solar panel is mounted, facing up to the sky, on the flat yellow "lid" you can see just on top of the display. Some people are concerned that solar farms will gobble up land we need for real farming and food production. 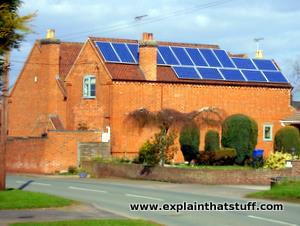 Worrying about land-take misses a crucial point if we're talking about putting solar panels on domestic roofs. Environmentalists would argue that the real point of solar power is not to create large, centralized solar power stations (so powerful utilities can go on selling electricity to powerless people at a high profit), but to displace dirty, inefficient, centralized power plants by allowing people to make power themselves at the very place where they use it. That eliminates the inefficiency of fossil fuel power generation, the air pollution and carbon dioxide emissions they make, and also does away with the inefficiency of transmitting power from the point of generation to the point of use through overhead or underground power lines. Even if you have to cover your entire roof with solar panels (or laminate thin-film solar cells on all your windows), if you could meet your entire electricity needs (or even a large fraction of them), it wouldn't matter: your roof is just wasted space anyway. According to a 2011 report [PDF] by the European Photovoltaic Industry Association and Greenpeace, there's no real need to cover valuable farmland with solar panels: around 40 percent of all roofs and 15 percent of building facades in EU countries would be suitable for PV panels, which would amount to roughly 40 percent of the total electricity demand by 2020. It's important not to forget that solar shifts power generation to the point of power consumption—and that has big practical advantages. Solar-powered wristwatches and calculators theoretically need no batteries (in practice, they do have battery backups) and many of us would relish solar-powered smartphones that never needed charging. Road and railroad signs are now sometimes solar powered; flashing emergency maintenance signs often have solar panels fitted so they can be deployed in even the remotest of locations. In developing countries, rich in sunlight but poor in electrical infrastructure, solar panels are powering water pumps, phone boxes, and fridges in hospitals and health clinics. Why hasn't solar power caught on yet? The answer to that is a mixture of economic, political, and technological factors. From the economic viewpoint, in most countries, electricity generated by solar panels is still more expensive than electricity made by burning dirty, polluting fossil fuels. The world has a huge investment in fossil fuel infrastructure and, though powerful oil companies have dabbled in solar power offshoots, they seem much more interested in prolonging the lifespan of existing oil and gas reserves with technologies such as fracking (hydraulic fracturing). Politically, oil, gas, and coal companies are enormously powerful and influential and resist the kind of environmental regulations that favor renewable technologies like solar and wind power. Technologically, as we've already seen, solar cells are a permanent "work in progress" and much of the world's solar investment is still based on first-generation technology. Who knows, perhaps it will take several more decades before recent scientific advances make the business case for solar really compelling? One problem with arguments of this kind is that they weigh up only basic economic and technological factors and fail to consider the hidden environmental costs of things like oil spills, air pollution, land destruction from coal mining, or climate change—and especially the future costs, which are difficult or impossible to predict. It's perfectly possible that growing awareness of those problems will hasten the switch away from fossil fuels, even if there are no further technological advances; in other words, the time may come when we can no longer afford to postpone universal adoption of renewable energy. Ultimately, all these factors are interrelated. With compelling political leadership, the world could commit itself to a solar revolution tomorrow: politics could force technological improvements that change the economics of solar power. And economics alone could be enough. The pace of technology, innovations in manufacturing, and economies of scale continue to drive down the cost of solar cells and panels. Between 2008 and 2009 alone, according to the BBC's environment analyst Roger Harrabin, prices fell by about 30 percent, and China's increasing dominance of solar manufacturing has continued to drive them down ever since. Between 2010 and 2016, the cost of large-scale photovoltaics fell by about 10–15 percent per year, according to the US Energy Information Administration; overall, the price of switching to solar has plummeted by around 90 percent in the last decade, further cementing China's grip on the market. Six of the world's top ten solar manufacturers are now Chinese; in 2016, around two thirds of new US solar capacity came from China, Malaysia, and South Korea. Photo: Solar cells aren't the only way to make power from sunlight—or even, necessarily, the best way. We can also use solar thermal power (absorbing heat from sunlight to heat the water in your home), passive solar (designing a building to absorb sunlight), and solar collectors (shown here). In this version, 16 mirrors collect sunlight and concentrate it onto a Stirling engine (the gray box on the right), which is an extremely efficient power producer. Photo by Warren Gretz courtesy of NREL (image id #6323238). The tipping point for solar is expected to arrive when it can achieve something called grid parity, which means that solar-generated electricity you make yourself becomes as cheap as power you buy from the grid. Many European countries expect to achieve that milestone by 2020. Solar has certainly posted very impressive rates of growth in recent years, but it's important to remember that it still represents only a fraction of total world energy. In the UK, for example, the solar industry boasted of a "milestone achievement" in 2014 when it almost doubled the total installed capacity of solar panels from roughly 2.8 GW to 5 GW. But that still represents only a couple of large power stations and, at maximum output, a mere 8 percent of the UK's total electricity demand of roughly 60 GW (factoring in things like cloudiness would reduce it to some fraction of 8 percent). According to the US Energy Information Administration, in the United States, where photovoltaic technology was invented, as of 2017, solar represents only 1.3 percent of the country's total electricity generation. Now that's 50 percent up on the previous year (when the figure was 0.9 percent) and over three times as much as in 2014 (when solar stood at just 0.4 percent). Even so, it's still about 25 times less than coal and 50 times less than all fossil fuels. In other words, even a 10-fold increase in US solar would see it producing less than half as much electricity as coal does today (10 × 1.3 = 13 percent, compared to 30.1 percent for coal in 2016). It's telling to note that two of the world's major annual energy reviews, the BP Statistical Review of World Energy and the International Energy Agency's Key World Energy Statistics, barely mention solar power at all, except as a footnote. Will that change anytime soon? It just might. According to a 2016 paper by researchers from Oxford University, the cost of solar is now falling so fast that it's on course to provide 20 percent of the world's energy needs by 2027, which would be a step change from where we are today, and a far faster rate of growth than anyone has previously forecast. Can that pace of growth possibly continue? Could solar really make a difference to climate change before it's too late? Watch this space! 1839: French physicist Alexandre-Edmond Becquerel (father of radioactivity pioneer Henri Becquerel) discovers some metals are photoelectric: they produce electricity when exposed to light. 1873: English engineer Willoughby Smith discovers that selenium is a particularly effective photoconductor (it's later used by Chester Carlson in his invention of the photocopier). 1905: German-born physicist Albert Einstein figures out the physics of the photoelectric effect, a discovery that eventually earns him a Nobel Prize. 1916: American physicist Robert Millikan proves Einstein's theory experimentally. 1940: Russell Ohl of Bell Labs accidentally discovers that a doped junction semiconductor will produce an electric current when exposed to light. 1954: Bell Labs researchers Daryl Chapin, Calvin Fuller, and Gerald Pearson make the first practical photovoltaic silicon solar cell, which is about 6 percent efficient (a later version manages 11 percent). They announce their invention—initially called the "solar battery"—on April 25. 1958: Vanguard, Explorer, and Sputnik space satellites begin using solar cells. 1962: 3600 of the Bell solar batteries are used to power Telstar, the pioneering telecommunications satellite. 1997: US Federal government announces its Million Solar Roofs initiative—to construct a million solar-powered roofs by 2010. 2002: NASA launches its Pathfinder Plus solar plane. 2009: Scientists discover that perovskite crystals have great potential as third-generation photovoltaic materials. 2014: A collaboration between German and French scientists produces a new record of 46 percent efficiency for a four-junction solar cell. 2020: Solar cells are predicted to achieve grid parity (solar-generated electricity you make yourself will be as cheap as power you buy from the grid). The Switch: How solar, storage and new tech means cheap power for all by Chris Goodall. Profile, 2016. An accessible economic argument demonstrating that year-on-year reductions in the cost of solar will soon make "the switch" away from fossil fuels inevitable. Physics of Solar Cells: From Basic Principles to Advanced Concepts by Peter Würfel. Wiley, 2016. Another academic book about solar semiconductor physics. Solar Energy: The Physics and Engineering of Photovoltaic Conversion, Technologies and Systems by Arno Smets at al. UIT Cambridge, 2016. A detailed but accessible introduction to solar science and technology. Solar power in Sustainable Energy Without the Hot Air by David MacKay. UIT Cambridge, 2009. This excellent book compares different ways of making energy without fossil fuels. Physics for Future Presidents by Richard Muller. W.W.Norton, 2008. Broadly similar to David MacKay's book, though with less math and more politics and not just about energy. Part 2 is, however, devoted to energy issues and Chapter 6 covers solar power. Eyewitness Energy by Jack Challoner. New York/London, England: Dorling Kindersley, 2012: Explains the basic concepts of energy and the history of how people have harnessed it. Ages 9–12. Energy by Chris Woodford. New York/London, England: Dorling Kindersley, 2007: My own colorful little book about energy in the modern world. Ages 9–12. Power and Energy by Chris Woodford. New York: Facts on File, 2004. Another of my books, this is a 100-page introduction to humankind's efforts to harness energy. Suitables for ages 10+. The Dawn of Solar Windows by Andy Extance, IEEE Spectrum, January 24, 2018. Can a window generate solar power efficiently and still remain transparent? Yes—and here's how researchers think it could be done. When Solar Panels Became Job Killers by Keith Bradsher. The New York Times, April 8, 2017. How China's solar panel manufacturers are conquering the world. Tesla Ventures Into Solar Power Storage for Home and Business by Diane Cardwell. The New York Times. May 1, 2015. How the pioneering electric car maker plans to revolutionize home energy storage as well. Solar Energy Isn't Always as Green as You Think by Dustin Mulvaney, IEEE Spectrum, August 26, 2014. Photovoltaics might sound environmentally friendly, but they're sometimes produced by processes that harm workers and the environment. Can Solar Power Go Truly Transparent? by Dave Levitan, IEEE Spectrum, August 25, 2014. Could we convert transparent windows into effective solar power producers? Perovskites: the future of solar power? by Bernie Bulkin, The Guardian, March 7, 2014. Most solar cells are currently manufactured using silicon semiconductors, but perovskites (minerals based on calcium titanium trioxide) could ultimately offer greater efficiency. Hot summer bestows solar power bounty on Britain by John Vidal, The Guardian, July 26, 2013. Even a dull northern area like the UK has great solar potential. Around half a million British buildings now have solar panels installed. Photovoltaic basics: An educational page from the US DOE's National Renewable Energy Laboratory—home of cutting-edge research into sustainable power. Measuring solar insolation: Simple maps from NASA compare the amount of sunlight received by different regions of our planet. Energy 101: Solar PV: The US Department of Energy's quick introduction explains how solar panels work and summarizes their advantages. How solar farms could work: The CSEM company of Switzerland have animated the idea of a solar farm that could work in the oceans or the desert. Suncatchers and Sterling Engines: Tessera Solar explain how solar power plants can use Stirling engines to convert thermal energy into electricity.